Pamela Carter-Birken is a doctoral student at Georgetown University who is researching Duncan Phillips’s relationship with Mark Rothko. She traveled to Paris to interview Arthur Hall Smith who was employed by the Phillips when the museum’s Rothko Room was first installed in 1960. She guest posts about their meeting here. “I still have dreams about the Phillips Gallery,” says artist Arthur Hall Smith of the Washington, D.C., art museum celebrating its 90th anniversary this year. Hired by founder Duncan Phillips in 1959 to be a “welcoming presence,” Smith worked at what is now known as The Phillips Collection for 14 years as curatorial assistant, tour guide, lecturer, and handyman. At The Phillips Collection, he heard abstract expressionist Mark Rothko demand the lighting be changed in the museum’s original Rothko Room, and he bantered in French with Russian painter Marc Chagall. Smith, a student of abstract painter Mark Tobey, left the Phillips in 1974 to teach painting and drawing at George Washington University, where he stayed for more than two decades. 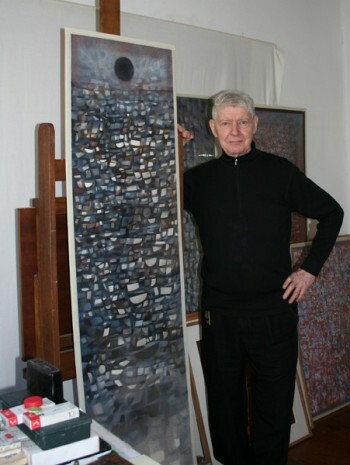 During his professorial years, Smith spent summers at his apartment in Paris, where he now lives year-round and continues to paint in his adjacent studio. The thick-walled building which houses his fourth-floor rooms contains elements from the fifteenth century and is located on the rue Visconti, among galleries of antiquities from Africa and South America. Even before he graduated from high school in his hometown of Norfolk, VA, Smith aspired to an artist’s life in Paris. In 1951, he was awarded a Fulbright scholarship to study art at the École des Beaux-Arts. He served in the Army during the Korean War then returned to the United States to study under Tobey at the University of Washington in Seattle. From there, he came to Washington, D.C., where he worked in federal jobs until his interview with Duncan Phillips. Green and Maroon (1953) is, in Smith’s opinion, the greatest of the Rothkos purchased by Duncan Phillips. “It is more subtle and also more complicated,” Smith says. This entry was posted in Experiment Station and tagged Arthur Hall Smith, Duncan Phillips, George Washington University, Mark Rothko, Mark Tobey, Monet. Bookmark the permalink. Every few years I google Professor Smith and see what turns up, how happy I was to see this! He was one of the best teachers of any subject I have ever studied. We’re happy you found Pam’s post and added your perspective as a student. Arthur Hall Smith was, and remains, the Teacher of my life. His insight, mastery, caring and wonderful sense of humor have informed my own teaching since I first met him at George Washington University. I return to him time and again for inspiration for my own artwork and for my teaching. His remembrances are absolute treasure. Sallye, thank you for your lovely comment. We were very pleased to publish this profile of Arthur on the blog as well as conduct an oral history interview with him, which can be found in our library. In the coming weeks, we plan to hang a work on paper of his. We’ll be sure to highlight it here.